Some moments resonate in our minds more than others. For me, this is one of them. This shot was taken some time ago in Iceland, at the foot of Seljalandsfoss waterfall. The falls drop some 60 meters from the cliffs of what was formerly the southern coastline. 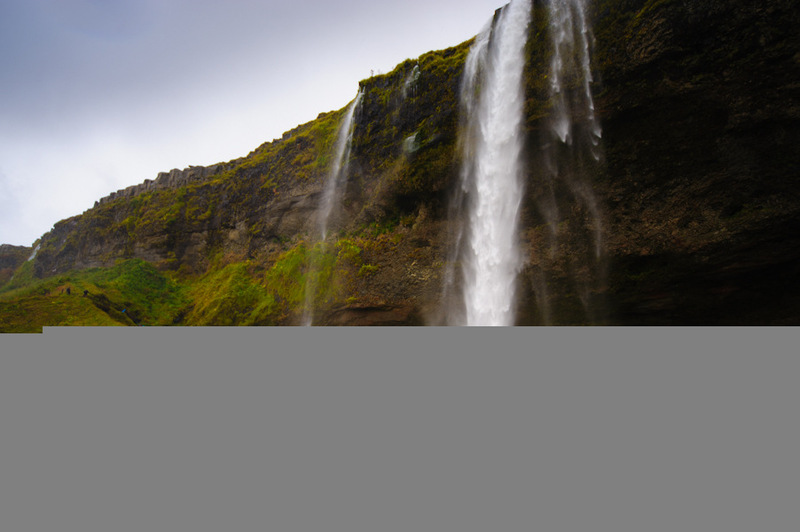 It is among the most well-known waterfalls in Iceland and certainly one of the most beautiful. One of the things which struck me in Iceland is the sheer quantity of waterfalls. In 12 days there, I daresay we saw more waterfalls than we did people. But back to this moment. I perhaps have more beautiful shots of this waterfall, but this one remains my favourite. It was windy and raining. Certainly not the ideal conditions to shoot. It was our second day of driving around Iceland, and we’d been on the go since the morning, awestruck for the most part – Iceland has got to be one of the most beautiful, wondrous places on Earth. A sense of wonder had been upon us since we landed at the airport, and a measure of peace had been gradually creeping upon us since. But I think I only realised how genuinely peaceful and happy I was the moment after I took this shot. The person standing on the black sands in the foreground looking tiny beneath the waterfall, is my wife. When we first approached, she had rushed forwards and stood, arms spread, head lifted and smiling, in the spray at the foot of the falls.